Last Thursday, my little sister and I joined our humans at the Shrine on Airline to watch the New Orleans Baby Cakes minor-league baseball team take on the Iowa Cubs, an affiliate of the World Series champion Chicago Cubs. 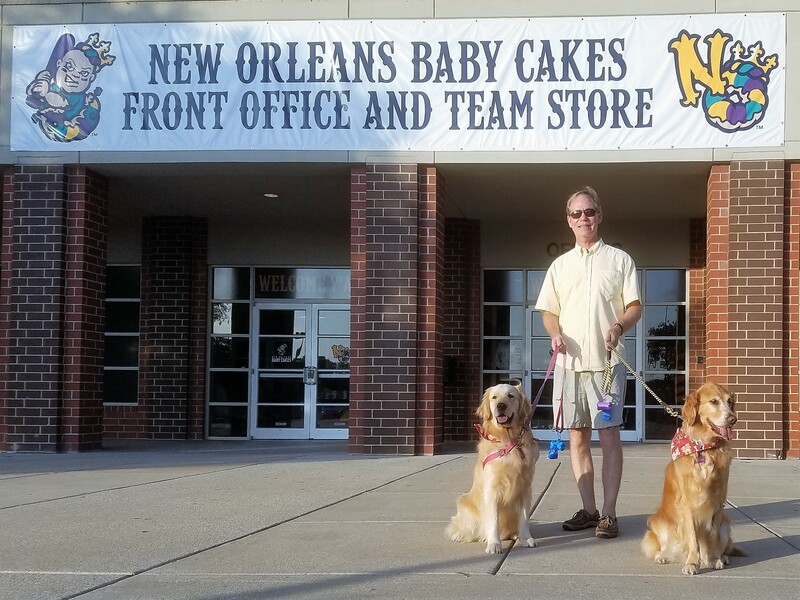 The Baby Cakes host Dog Day at each of their Thursday-evening games. 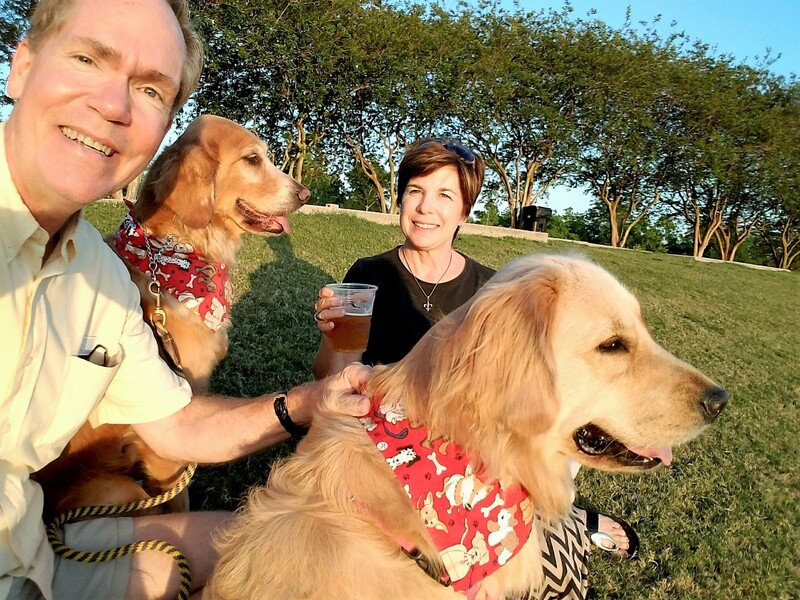 Every Thursday also happens to be Thirsty Thursday with $2 12-ounce domestic drafts, which comes in very handy for all the humans who are stressed about ensuring that their four-legged family members behave themselves for nine innings. Technically, this wasn’t my first time at the ballpark. I concluded last year’s A to Z Challenge with a trip to Zephyr Field, as it was known them, but I only got to see the outside that day. (You can click here to read that post.) And back then, our Triple A Miami Marlins affiliate team was called the Zephyrs. Then they had a big contest to change the name and, in a bit of a controversial move, they became the Baby Cakes. It’s a play on our Mardi Gras tradition of placing a little plastic baby in our king cakes, but it’s a little odd because no one ever says “baby cakes” around here. Nevertheless, the new name has grown on us and the logo is pretty fabulous, so we’ll give our hometown team a pass. But I digress. Back to the game. Humans and their canines have the option of enjoying the game from two different locations. Most of us sat beyond the outfield in an area of the ballpark called the levee. The nice people with the Baby Cakes set up water bowls and kiddy pools for the pups to enjoy, and there’s plenty of room to stretch your legs . . . all four of them. 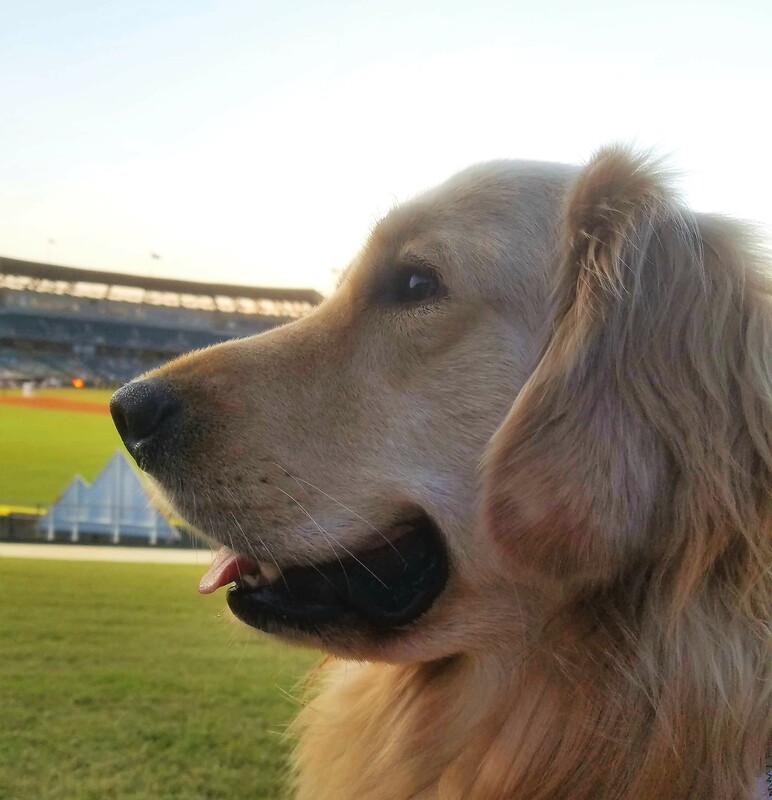 Dogs are also invited to join their humans in certain sections of the stands along the first base side of the ballpark. We decided that Tallulah probably wasn’t quite ready for that level of sophistication, but we did stop by to enjoy the view. And speaking of Tallulah, her mind tended to wander during the game. She was far more interested in the dogs around us and the hotdogs and Cracker Jacks their humans were enjoying than she was in the action on the diamond. My big round eyes, on the other hand, were glued to the game . . .
. . . except for when I dosed off briefly. Turns out baseball is pretty conducive to napping. My humans, Tallulah, and I say cheers to the Baby Cakes. We had a fantastic time and our hometown team won the evening we were there. 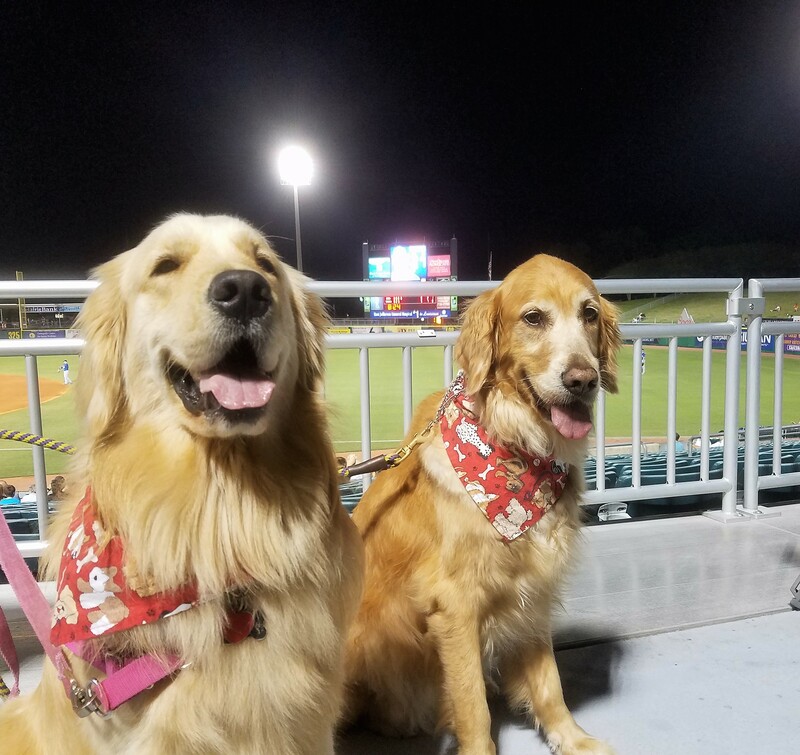 We definitely plan on attending another Thursday evening Dog Day game this season. Here’s hoping we catch a homerun ball or at least have a little taste of a hot dog on our next visit. 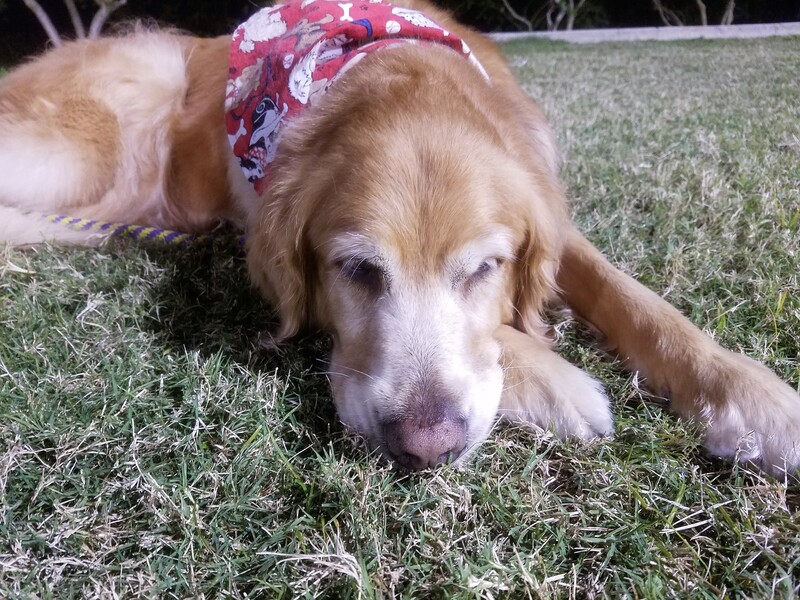 Have you ever gotten to join your humans at a sporting event in your hometown? 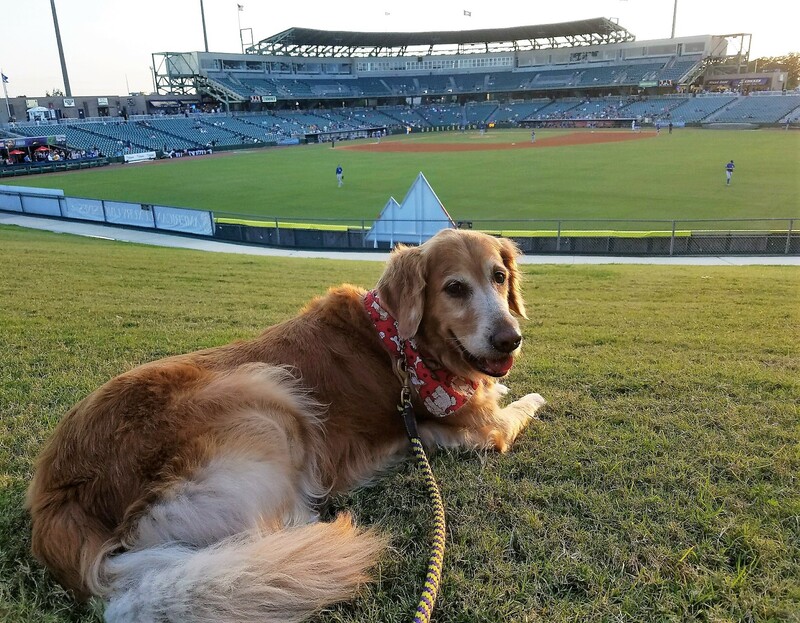 Zephyr Field is even dog friendly . . . at least one day out of the year. 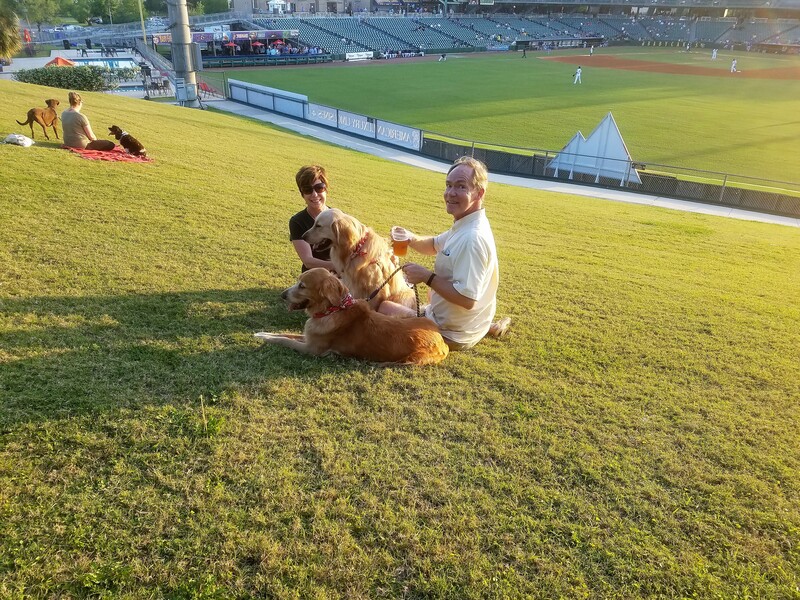 The Zephyrs hosted Bark in the Park at a mid-April game. The first 500 fans received dog bowls. Unfortunately, my humans had human commitments that day, so I didn’t get to attend. I really need to work on getting my driver’s licence so I don’t have to count on them to take me places. There’s a pretty good chance that the Zephyrs won’t be the Zephyrs this time next year and that the ballpark will have a new name too. The Zephyrs, who moved to New Orleans from Denver almost 25 years ago, were named for a train that connected Denver to Chicago. (It’s interesting that The Zephyr rollercoaster was one of the main attractions at the old Pontchartrain Beach Amusement Park in New Orleans, but that is not the origin of the baseball team’s present name.) There’s currently a contest to rename the team. If you have a good idea, click here. You could win some lovely prizes! Speaking of prizes, this is the final day of my Blogging from A to Z Challenge, and I wish I had prizes for everyone who stuck with me throughout the journey . . . whether you stopped by just one day or checked in all 26. I hope you learned a little something about the city of New Orleans, my beautiful hometown. As far as I know, there isn’t a Reader of the Year Award associated with the Blogging from A to Z Challenge, but if there were my friend Emma would definitely go home with the trophy. Emma commented on every single post in my journey through the alphabet and throughout the Big Easy. Thank you oh so very much, Emma. I am so happy to count you as one of my truly amazing blogging friends. 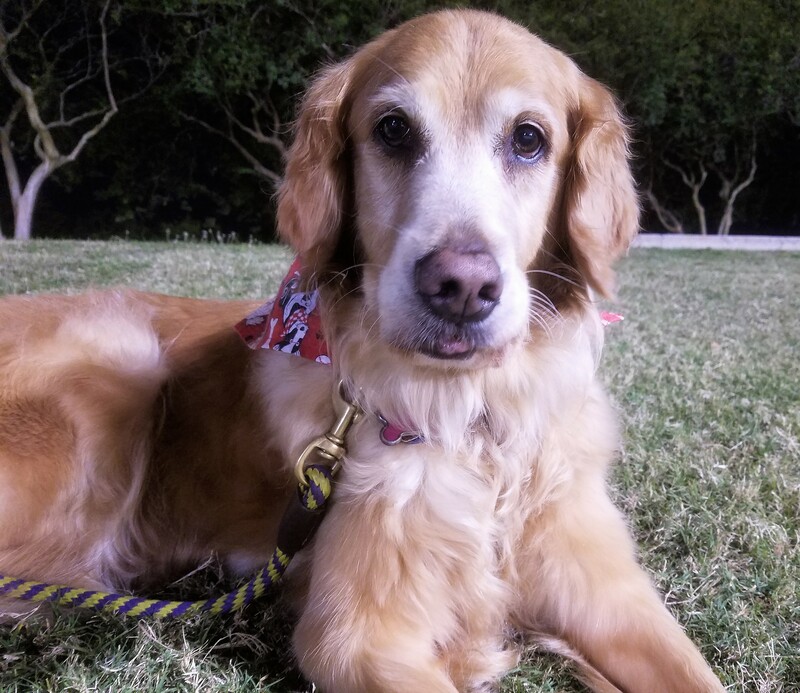 Please drop by Emma’s beautiful, informative, entertaining, and totally sweet blog by clicking here. You’ll love her . . . I promise. Y is for Yvonne LaFleur, a tony fashion gallery in New Orleans’ Riverbend neighborhood. In 1969, as a young graduate from Louisiana State University, Yvonne LaFleur invested 100 $100 bills in her dream. She’s been at this location at 8131 Hampson Street ever since, dressing generations of brides and debutantes, carnival queens and ladies who lunch. And if you tune in to the Kentucky Derby next weekend and scan the audience, chances are pretty good that you’ll spot at least a few of Yvonne LaFleur’s millinery creations. At this point you might be thinking, “Sounds great, but is there just a little something that I can bring home as a memento of my visit to the Crescent City?” Yes, there is. Yvonne LaFleur bath gel, lotion, powder, candles, and perfume range in price from $25 to $55. So hop on the St. Charles Avenue Streetcar and head Uptown to Stop #299. Take a short walk toward the Mississippi River, and bring home a beautifully fragrant piece of New Orleans’ elegant history. This post is part of the Blogging from A to Z Challenge. Please click here for a link to the challenge homepage and a list of the bloggers who are participating. X is for Xavier University of Louisiana, the only historically Black, Catholic university in the United States. As you approach the French Quarter and Central Business District while traveling from the New Orleans airport, you can’t help but notice a cluster of buildings on the right with their green roofs. That’s Xavier University. Xavier traces its history to a New Orleans high school founded in 1915 by St. Katharine Drexel of Philadelphia and the Sisters of the Blessed Sacrament, a religious community dedicated to the education of African Americans and Native Americans. The four-year college program was created in 1925. The sisters ran Xavier until 1970, when they transferred the university’s administration to a lay-religious board of trustees. Xavier University is home to one of only two pharmacy schools in Louisiana. The university’s College of Pharmacy was established in 1927. Xavier is one of nine four-year colleges and universities in New Orleans, a relatively large number of schools for a city that had a population of less than 379,000 in 2013. Students from all over the nation and the world come to New Orleans to continue their educations. Not surprisingly, quite a few choose to stay. W is for Warren Easton Charter High School. Today and tomorrow, we’re going to concentrate on the education scene in New Orleans, and we’re starting with one of the oldest public high schools in the state of Louisiana. Opened in 1913 at 3019 Canal Street, Warren Easton was initially a boys’ school named for the city and state’s first supervisor of education. (My human mommy’s grandfather graduated from Warren Easton in 1930.) It became co-ed in 1952 and was integrated in 1967. In 1977, Warren Easton became a fundamental magnate school, and it out-performed almost all other schools in the Orleans Parish school system from 2000 to 2005. At the start of the 2005-2006 school year, Hurricane Katrina struck the city and Warren Easton was closed for a year. And last but not least go find your joy. It’s what you’re going to remember in the end. It’s not the worry, it’s not the what-ifs. It’s the joy that stays with you. And I want to thank you for the joy that Warren Easton brings me every day. V is for Vaughan’s Lounge, located in New Orleans’ Bywater neighborhood at the corner of Dauphine and Lesseps Streets. Vaughan’s was featured on HBO’s Treme. If there were a dictionary entry for “neighborhood dive bar,” a photo of Vaughan’s Lounge would accompany the definition. Vaughan’s is the place to be for live music on Thursday nights. And when the bands aren’t playing, the jukebox is. If you’re lucky enough to be visiting the Big Easy in fall, be sure to swing by Vaughan’s on a Saturday night to watch the LSU Tigers or a Sunday afternoon to catch a New Orleans Saints football game. At Vaughan’s, the patrons even groove to football songs, so be sure to bring your dancing shoes. Urban South was founded by brewery president Jacob Landry, who developed a passion for craft beers when he spent a college year in Europe. He worked in education before pursuing his brewing dream. The brewery’s taproom is open Thursday through Sunday, with a wide variety of Urban South beers on tap and multiple tours each day. (Check out the website here for specific times.) There are fun board games available for humans to keep themselves entertained and food trucks make appearances so no one goes hungry. The nice people at Urban South Brewery are the new kids on the ever-expanding New Orleans beer-brewing block, and we are super excited to welcome them . . . especially since they are so welcoming to our doggy friends. I hope you’ll stop by on your next tour of New Orleans. You just might see me there.